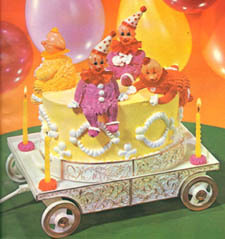 Because cake is such a big part of children's parties, there are tons of ugly, weird children's cakes in the Yearbook of Cake Decorating. Most of them are way more interesting as folk art than as food. Technically this is a cake for an expectant mother, not a child. Whatever. 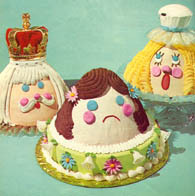 I still think cakes ostensibly shaped like people are pretty skeevy. This is even after reading Margaret Atwood's The Edible Woman. I'll bet if you were pregnant, the last thing you would want to do is symbolically eat your young. Unless you were a neurotic gerbil, of course. Aside from the fact that they just look majorly creepy to me, I don't think I'd want to take the chance of accidentally serving someone a toothpick or a piece of wire thast goes into the making of all those tacky decorations. I do love Miss Muffet's hat, though. It's a cupcake, and it's trimmed with a substance called Tuk-N-Ruffle®. Hee! 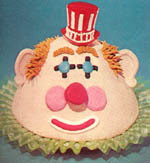 It's not credited in the book, but I do believe that's some more Tuk-N-Ruffle under the clown! Oh no, the clowns are coming on their big wagon and they're going to kill me! I know I'm not the only person around who finds most clowns frightening rather than entertaining. Particularly when they're as nasty-looking as the evil orange-headed ones on that stupid wagon. This isn't so scary to look at, per se. Actually, I think it's sort of cute. The scary part comes in the assembly and the fact that so little of it is edible. 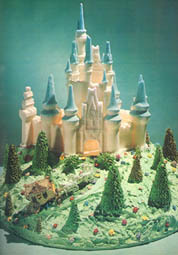 The castle is made from fifteen pounds of granulated sugar mixed with food colouring. The "mountain" is crumpled newspapers topped with icing. The evergreens are plastic cones on sticks, again covered in icing. So which parts are you supposed to eat? The castle? I do know I wouldn't want to be the person who fed a party full of little girls fifteen pounds of granulated sugar. Okay, now that would be scary. at the people responsible for these cakes?